ST. THOMAS was one of the fishermen on the Lake of A Galilee whom Our Lord called to be His apostles. By nature slow to believe, too apt to see difficulties, and to look at the dark side of things, he had withal a most sympathetic, loving, and courageous heart. Once when Jesus spoke of the mansions in His Father's house, St. Thomas, in his simplicity, asked: "Lord, we know not whither Thou goest, and how can we know the way?" When Jesus turned to go toward Bethany to the grave of Lazarus, the desponding apostle at once feared the worst for his beloved Lord, yet cried out bravely to the rest: "Let us also go and die with Him" After the Resurrection, incredulity again prevailed, and whilst the wounds of the crucifixion were imprinted vividly on his affectionate mind, he would not credit the report that Christ had indeed risen. But at the actual sight of the pierced hands and side, and the gentle rebuke of his Saviour, unbelief was gone forever; and his faith and ours has ever triumphed in the joyous utterance into which he broke: "My Lord and my God!" 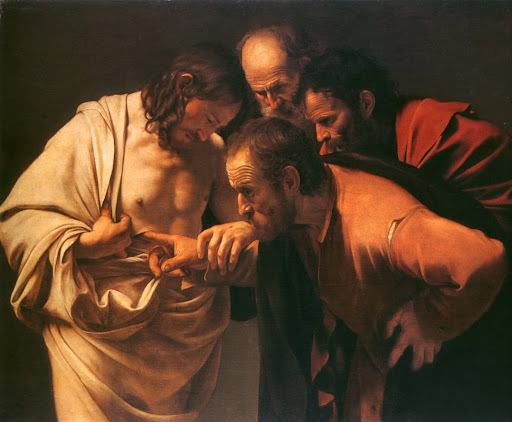 Reflection.--Cast away all disquieting doubts, and learn to triumph over old weaknesses as St. Thomas did, who "by his ignorance hath instructed the ignorant, and by, his incredulity hath served for the faith of all ages."